William Thomas Tutte created one of the first Graph Drawing Algorithms, described in his 1963 paper "How to draw a graph". Tutte's algorithm computes the positions of vertices using linear equations. In this talk we review Tutte's algorithm and the extension of his algorithm to weighted edges. We discuss the complexity and stability of the algorithm. The algorithm can be used as a tool for a number of problems in information visualization, such as animation in-betweening, clustering, focus+content views, and constrained layout. The algorithm is also useful as a technique in the mathematical theory of geometric graphs. 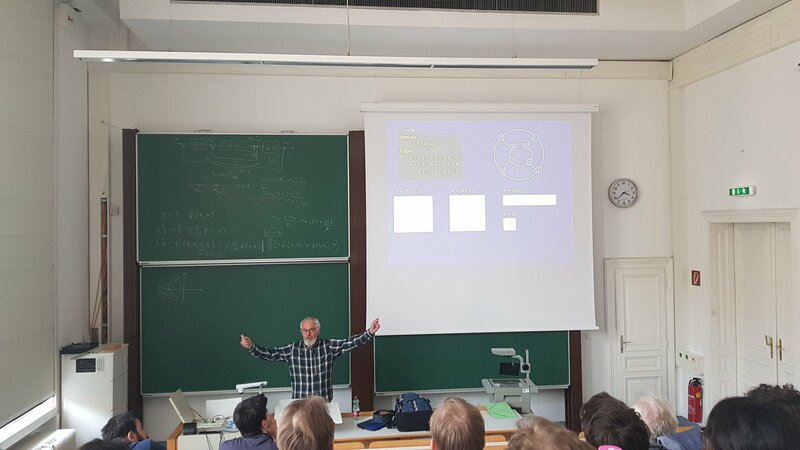 Peter Eades is an Emeritus Professor in the School of Computer Science at the University of Sydney, known for his research in Graph Drawing. He gained his PhD from the Australian National University in 1978, and has worked in Universities and Research Institutes across the world. Professor Peter Eades has been investigating methods for visualization of networks since the 1980s. The algorithms described in his papers on this topic are currently commonly used in diverse software systems, from social networks, biological networks, CASE tools, to security. Peter is currently semi-retired, however he continues to research the mathematics and algorithmics of geometric graphs.